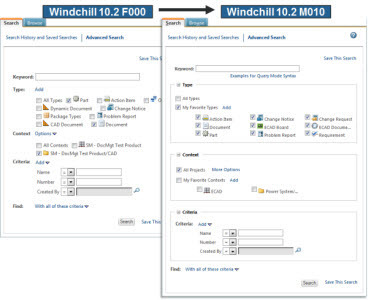 In PTC Windchill 10.2 M010, the Advanced Search page features a redesigned layout for improved usability and user customization. Criteria are arranged into collapsible category groups. Under Type, you can select between All Types or My Favorite Types. Under Context, you can select context options (such as All Contexts) or My Favorite Contexts. The Examples for Query Mode Syntax link appears when the Search Mode preference is set to Advanced. Select the checkbox next to My Favorite Types to select all object types listed below it. Clear the checkboxes next to individual object types to exclude those types from a search. Note: This does not remove the object type from the favorites list. Select the checkbox again to include the object type in another search. Selections are maintained between search sessions. To remove a favorite type or context, hover over the name to see a remove icon. For more information, see the “Advanced Search” topic in the PTC Windchill Help Center. Tip: Enter the topic name in the PTC Windchill Help Center search field to easily navigate to the topic. Improvements to the Advanced Search Layout Compared to PTC Windchill 10.2 F000.